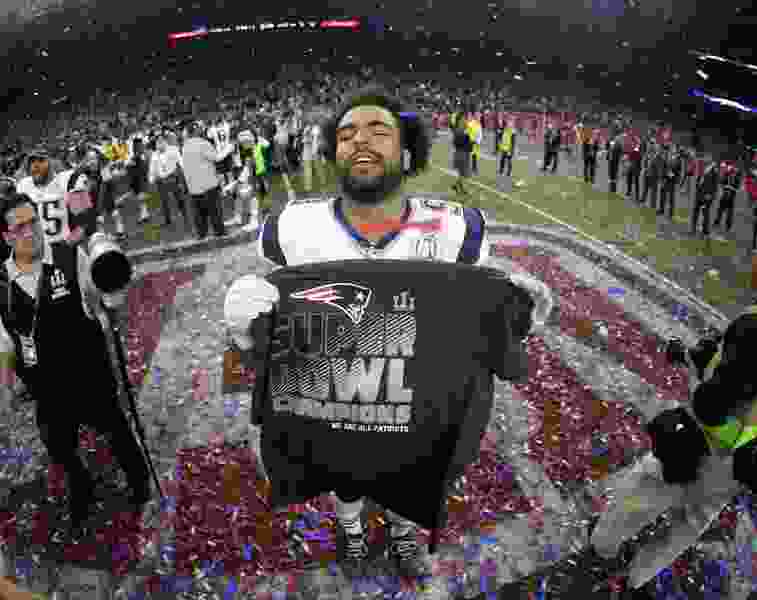 (AP Photo/Mark Humphrey) New England Patriots' Kyle Van Noy celebrates after the NFL Super Bowl 51 football game Sunday, Feb. 5, 2017, in Houston. The Patriots defeated the Atlanta Falcons 34-28 in overtime. Minneapolis • The New England Patriots’ middle linebacker is the team’s No. 3 tackler, a pass-rusher whose sack helped derail Jacksonville’s final drive in the AFC championship game and another example of how coach Bill Belichick and his staff maximize players who have failed elsewhere in the NFL. That’s Van Noy’s shortened name of his old school, as he cites in the videotaped starting lineups of NBC’s “Sunday Night Football” productions — presumably to be included in the Super Bowl LII telecast from Minneapolis. His playful treatment of the introduction stems from a secret language with former BYU teammates Ross Apo and Cody Hoffman and reflects his personality traits of “a little bit different, a little bit of zest,” Van Noy said. That’s KVN, in a snapshot. “A lot of people can’t say they’re happy,” Van Noy said. “I can do that.” Yet in some ways, he cares about more than just his self-image. He’s motivated by perceived slights of himself and a New England defense that’s naturally overshadowed by Patriots quarterback Tom Brady and his offense. BYU product Kyle Van Noy (No. 53) and Utah alumnus Eric Rowe (No. 25) will be on the field for more than half of New England’s defensive plays Sunday. They hope to become the first Utah college products to play significant roles in consecutive Super Bowl victories since BYU’s Gordon Gravelle, an offensive lineman for Pittsburgh in Super Bowls IX and X. Utah State’s Lionel Aldridge, a Green Bay defensive lineman, and Utah’s Marv Fleming, a Packers tight end, won in Super Bowls I and II. Fleming joined Miami teammate Manny Fernandez, a defensive lineman from Utah, in winning Super Bowls XII and XIII. Ordinarily, as a second-round draft choice of Detroit in 2014, Van Noy couldn’t consider himself an overachiever. Yet because of the way his BYU career started, with his enrollment deferred after he faced DUI charges in high school in Reno, Nev., and how the Lions gave up on him, he can claim to have come a long way. Christian Cox, a defensive lineman from the University of Utah, spent a Super Bowl season with Patriots and observed how Belichick and his staff keep finding and developing players such as Van Noy. “It’s insane how they can just plug in new people, second-chance guys, and they flourish,” Cox said. Steven Senne | The Associated Press. 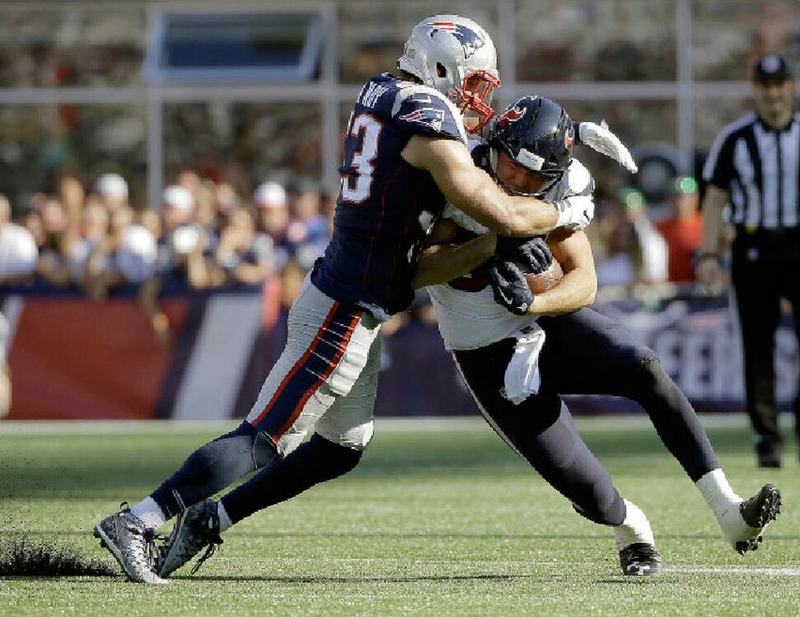 New England Patriots linebacker Kyle Van Noy, left, tackles Houston Texans tight end Ryan Griffin during the second half of an NFL football game, Sunday, Sept. 24, 2017, in Foxborough, Mass. Van Noy’s response to tough times has carried him to this point of his career. DUI charges in high school could have kept him from his coming to BYU, but he became one of the most productive defensive players in school history. He was the biggest star of a defense that also featured current NFL players Ziggy Ansah and Daniel Sorensen. Van Noy had to be reined in, early in his career. Kelly Poppinga, then BYU’s linebackers’ coach, benched him during his sophomore season, because he was straying too much from his assignments. “I took a lot of heat for that, not playing our best player, but he learned a valuable lesson,” Poppinga said. As a junior in 2012, Van Noy recorded 13 sacks and 22 tackles for loss. He finished that season with an epic fourth quarter against San Diego State in the Poinsettia Bowl, making a strip-sack and recovering the ball in the end zone and then returning an interception 17 yards for another score. He made less statistical impact as a senior, but was drafted No. 40 overall by Detroit. His career never got going with the Lions, who traded him for merely an exchange of draft picks — seventh round for sixth round. As a pro, Van Noy has done his best work in AFC championship games. He made four solo tackles against Pittsburgh last year and was New England’s co-leading tackler this year with nine stops (five solo), including the sack of Blake Bortles on second down from the Patriots’ 38-yard line. His wife was only partly impressed by the forced fumble. Marissa Van Noy later asked him, “Why didn’t you recover it?” The Jaguars retained possession, but were stopped on fourth down. In the Super Bowl vs. Atlanta last February, Van Noy was credited with only an assisted tackle, but it was vital. He joined Trey Flowers in sacking Matt Ryan on a third-down play late in the third quarter when the Patriots trailed 28-9 in their eventual 34-28 overtime victory. When • Sunday, 4:30 p.m.